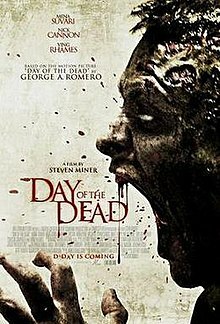 Day of the Dead is a 2008 American horror film about a virus outbreak that causes people to turn into violent zombie-like creatures. It is a loose remake of George A. Romero's 1985 film of the same name, the third in Romero's Dead series, and it is the first of two remakes of the original 1985 film; the other is Day of the Dead: Bloodline (2018). The 2008 film was directed by Steve Miner and written by Jeffrey Reddick. Day of the Dead (2008) was principally shot in Bulgaria, with limited shooting in Los Angeles, California. Tyler Bates provided the soundtrack, and screenwriter Jeffrey Reddick has a cameo appearance as an ill-fated police officer. In May 2008, in Leadville, Colorado, Trevor and his girlfriend, Nina, have a romantic encounter in an abandoned building. As they return to their respective parents' homes, they encounter a military roadblock. An angry man demands medical care for his child, revealing an outbreak has occurred. The teens meet Captain Rhodes and Corporal Sarah Cross, Trevor’s sister. Soon afterward, Privates Bud Crain and Salazar show up, and Bud immediately falls in love with Sarah. Sarah and Bud visit her sick mother, and she visits her brother, Trevor. Sarah also visits Trevor's friend, Kyle, after she learns his symptoms are similar to her mother's. When Bud and Sarah arrive at Kyle's house, they find the mauled bodies of his parents stashed behind a curtain and Kyle missing. They radio Captain Rhodes and take Nina, Trevor, and their mother to the local hospital. There, Sarah talks to Dr. Logan at the urging of Rhodes, while out in the waiting room all the infected become catatonic. Bud runs to alert Sarah when all the infected suddenly reanimate. They turn into zombies, transforming while catatonic. They have superhuman strength that allows them to run, jump long distances, and crawl on the ceiling. Nina and Trevor escape, seeking refuge in the local radio station. Captain Rhodes fights off the zombies before perishing. After becoming trapped in a storage room, Sarah, Dr. Logan, and Bud crawl through ceiling ducts into another room, where they find Salazar. Uninfected, he returns with them through the ducts to the storage room. The transformed Rhodes, also in the room, pursues them through the duct and nearly catches up with Sarah. Although she escapes, Rhodes bites Bud's hand as Bud replaces the ceiling grill. After dispatching Rhodes, the four escape from the hospital by jumping from the storeroom window into the car park, which is overrun with zombies. Here, they discover the zombies can be killed by shooting them in the head or setting them on fire. In the confusion, Dr. Logan deliberately pushes a non-infected girl into the path of the zombies and escapes in an abandoned vehicle. Sarah, Bud, and Salazar win their battle with the zombies and drive away in a military vehicle. They make a stop at the gun store while Bud stays in the vehicle. When Sarah and Salazar return they find Bud has transformed. Instead of killing him, Sarah insists they take him with them, because Bud is restrained by plastic wrist-ties and poses no threat. Sarah and Salazar hear Trevor call for help on the radio and go to the radio station to rescue his group. While driving there Sarah crashes into her zombified mother and kills her before rescuing Trevor and Nina from the radio station. The group heads back to the abandoned warehouse. When Bud does not attack his friends, Sarah believes it is because he was a vegetarian, but Salazar speculates Bud is attracted to Sarah. The group finds an underground bunker, where they reunite with Dr. Logan. They learn about a government project directed by Dr. Engel, which accidentally created the virus that turned the townspeople into zombies. The group explores the bunker, but Dr. Engel attacks and kills Logan. Later, Salazar is swarmed by zombies and - as he perishes - allows Sarah to escape and reunite with Trevor and Nina. While hiding, the trio finds several large gas cylinders. Sarah decides to lure the zombies into the storeroom and burn them with the cylinders. They begin modifying the cylinders into a giant flamethrower. Sarah finds and attracts a mob of zombies. The zombified Dr. Engel drops down from the ceiling behind Sarah and grabs her, but before she is bitten, Bud shoots at Engel. This leads Engel and the other zombies to attack Bud, dismembering him. Sarah leads the zombies to the room where Trevor and Nina are hiding, and they torch the zombies. The three escape the bunker and drive off as a zombie suddenly jumps in front of the camera. ^* Sarah is referred to as Cross during the film, but she and her brother are listed as Bowman in the credits. Reddick, who adapted the script from Romero's original concept, has stated that this film does not have any connection to Zack Snyder's 2004 remake of Dawn of the Dead (although Ving Rhames had also appeared in that film, but as a different character). He told ComingSoon.net: "It's going to be a separate movie...We wanted to pay homage to the original with the military and the scientists and the socially relevant stuff that George Romero always does, but we wanted to put a fresh spin on it." Variety announced the project in July 2006, and shooting ended on September 7, 2006, after six weeks in Sofia, Bulgaria. Re-shoots took place in June 2007. First Look Pictures released it on DVD in the United States on April 8, 2008. The film was poorly received by both fans and critics. Rotten Tomatoes, a review aggregator, reports that 14% of seven surveyed critics gave the film a positive review; the average rating is 2.7/10. Steve Barton of Dread Central rated it 2/5 stars and called it "dead on arrival". Barton called Cannon's performance offensively stereotypical. Buz Wallick, also writing for Dread Central, rated it 1.5/5 stars and called it "an awful film with awful special features that will hopefully fade from memory in time". Heather Seebach of Shock Till You Drop called it "cheap horror for indiscriminate genre fans" that "tiptoes on so-bad-it-is-funny territory". Brian Orndorf of DVD Talk rated it 0/5 stars and called it "a vile, pathetic, slapdash motion picture". ^ Box Office Information for Day of the Dead. The Numbers. Retrieved December 8, 2012. ^ "Day of the Dead (2008)". Box Office Mojo. Retrieved October 21, 2015. ^ McFarland, Kevin (2013-11-27). "The Day Of The Dead remake picks a director". The A.V. Club. Retrieved 2015-03-06. ^ Douglas, Edward (2006-02-01). "Exclusive: The Makers of Tamara". ComingSoon.net. Archived from the original on 2006-02-09. Retrieved 2015-03-06. ^ Forster, Pamela (2006-07-17). "Brand new 'Day' for trio". Variety. Retrieved 2015-03-06. ^ Schwinke, Theodore (2006-09-07). "Nu Image wraps Bulgarian shoot for Day Of The Dead". Screen Daily. Retrieved 2015-03-06. ^ Siebalt, Joshua (2007-06-19). "Day of the Dead Re-Shot". Dread Central. Retrieved 2015-03-06. ^ a b Orndorf, Brian (2008-04-01). "Day of the Dead (2008)". DVD Talk. Retrieved 2015-03-06. ^ Dendle, Peter (2012). The Zombie Movie Encyclopedia, Volume 2: 2000–2010. McFarland & Company. pp. 52–53. ISBN 978-0-7864-6163-9. ^ "Day of the Dead (2008)". Rotten Tomatoes. Retrieved 2015-03-06. ^ Barton, Steve (2008-02-16). "Day of the Dead (2008)". Dread Central. Retrieved 2015-03-06. ^ Wallick, Buz (2008-04-07). "Day of the Dead 2008 (DVD)". Dread Central. Retrieved 2015-03-06. ^ Seebach, Heather (2008-04-23). "Day of the Dead (2008)". Shock Till You Drop. Retrieved 2015-03-06. This page was last edited on 30 March 2019, at 18:45 (UTC).